What did you think of Adding and Subtracting Decimals ? 2. If the decimals have different numbers of digits, then fill in the blank spaces with zeros so that the decimals have the same decimal digits. 3. Add as usual from right to left, column by column. 4. Place the decimal point in the sum, in line with the other decimal points. For example: Let's add 14.26 and 23.1. Notice that the decimal digits are not the same. 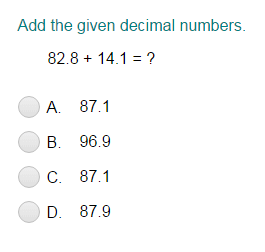 Let's write the decimals one under the other, with the decimal points lined up and add zeros so that the decimals digits become same. Now, add from right to left, column by column. Place the decimal point in the sum, in line with the other decimal points. So, the sum is 37.36.